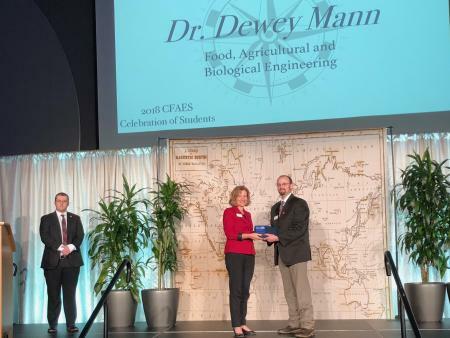 Dr. Dewey Mann, Lecturer in the Department of Food, Agricultural and Biological Engineering (FABE), was named the 2018 recipient of the Outstanding Academic Mentor Award at the annual CFAES Celebration of Students. Mann was nominated by Cody McClain, a junior Agriscience Education major. McClain has gotten to know Mann through the Ag Safety Program, by taking several of his courses, and as a member of the Agricultural Systems Management (ASM) Club. According to McClain, one of Mann’s famous quotes among his students is “go forth and do great things,” a line that is often said at the end of a class, meeting, or email. It’s a line that embodies Mann’s mentoring spirit and philosophy in helping his students in their endeavors as they pursue success. After being recognized last year at the CFAES Celebration of Students with the 2017 Outstanding Service to Students Award, this year’s recognition was a shock to Mann. Mann received his BS in agricultural systems management from the University of Missouri in 2007. After receiving his MS in agricultural and biological engineering from Purdue University in 2010, Mann joined FABE at The Ohio State University to pursue his PhD. That same year, Mann began advising the ASM Club, and continues to serve as their advisor to this day. Mann completed his PhD in May of 2017 and has remained with the department as a Lecturer and Faculty Advisor to nearly all of the over 90 ASM students at Ohio State. “Take ownership of your education. Plan ahead and communicate regularly with your advisor. Come to them with proposed solutions, and not just a list of problems. Commit to your studies, but have balance that includes a mix of professional development, leadership opportunities, work experience, and networking. Now go forth and keep doing great things!"